If you watched the Super Bowl (or read our recent article) you’ll know that THE eyewear moment of the night was Bruno Mars’ amazing retro-inspired look. The singer stole the show during his half-time appearance in which he wore head to toe Versace and a pair of round-frames glasses with gold frames. Very 90’s. However, Bruno wasn’t the only celebrity wearing some seriously stylish shades at Levi Stadium. A whole host of famous faces flocked to San Francisco and brought their eyewear game too. So, let’s take a look at the best celebrity eyewear sightings of Super Bowl 50. While Kate Hudson may be an LA girl now, she was raised in Colorado, so there’s no surprise that she was rooting for the Bronco’s on Sunday night. 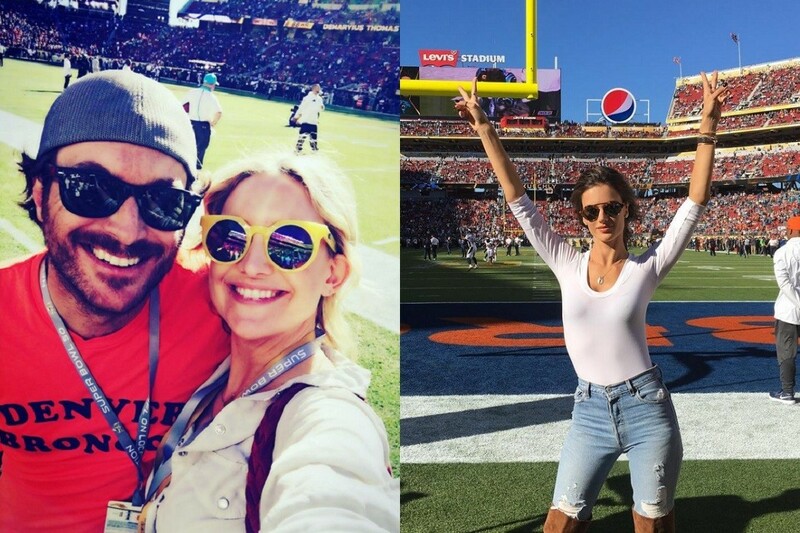 She attended the game with her brother Oliver and shared a couple of snaps of the two wearing Denver Bronco’s gear as well as some stylish eyewear. Her brother opted for classic Ray Ban Wayfarers and Kate wore an eye-catching pair of yellow-frames shades. These sunny specs must be a favourite of Kate’s, as we’ve seen them on her a couple of times before. We can’t quite identify the brand of Kate’s shades, but SelectSpecs have a range of yellow sunglasses that will give you the same look. 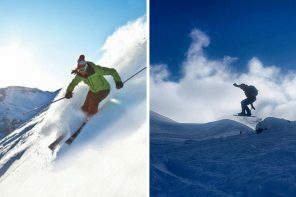 Try the Savannah 8121 wayfarer sunglasses or the Polaroid PLD 6002/S shades. David Beckham treated his oldest son to some quality father-and-son time as Brooklyn attended his first ever Super Bowl game alongside his dad. Before the game, the pair shared this selfie and we couldn’t help but notice their amazing eyewear. Both David and Brooklyn wore similar round-framed styles in a tortoiseshell finish. Well…when your dad’s as cool as David Beckham, why wouldn’t you want to steal his style?! As you can see from the photo, Brooklyn is wearing a pair of Ray Ban sunglasses which look a lot like the Ray Ban RB2447 sunglasses, available online at Select Specs. Get David’s look with the Ray Ban RB2180. Also spotted at Super Bowl 50 was Victoria’s Secret model Alessandra Ambrosio. As always, the supermodel looked amazing in a casual outfit of jeans, a white T-shirt and a pair of cool statement sunglasses. Her retro-inspired round frames gave Bruno Mars a run for his money! We can confirm that Alessandra Ambrosio is wearing a celebrity favourite – the Illesteva Milan III sunglasses in a tortoiseshell finish. Get a similar look with the Dior Reflected sunglasses, another celeb favourite from SelectSpecs. Singer Alicia Keys certainly caught our eye with the sunglasses she wore to the Super Bowl on Sunday. Attending the game with her husband and her son Egypt, she showed off her game-day style with a denim jacket and a pair of on-trend round sunglasses with blue mirrored lenses. Proof that she’s one cool mum. If you want to copy Alicia’s awesome eyewear look, check out the Lui Jo LJ101SR sunglasses which feature retro-inspired round frames and cool blue lenses. Last but not least, Hollywood couple Catherine Zeta-Jones and Michael Douglas showed up in style to watch the game alongside their celebrity friends on Sunday. Before kick-off, Catherine shared this Instagram snap of herself dressed in a chic cream trouser suit which she’d accessorised with a glamorous pair of cat eye frames in black. Michael wasn’t pictured, but he wore a classic pair of Clubmaster shades. 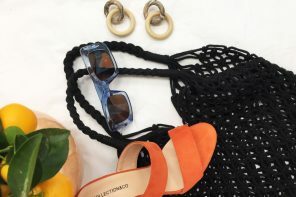 Catherine’s shades of choice are a mystery, but you can steal her style with the very similar Moschino MO725S or the Just Cavalli JC490S sunglasses which both feature black cat eye frames. 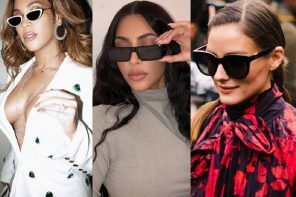 Did you spot any Super Bowl-celebrating stars in sunglasses that we missed? If so, let us know in the comments below or tweet us @SelectSpecs!